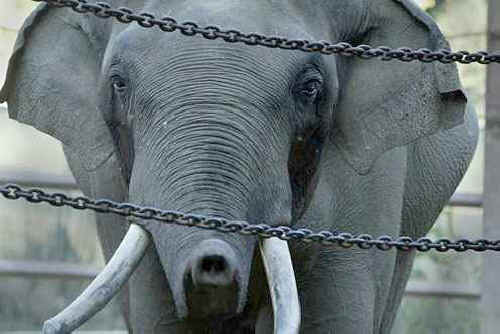 Billy the elephant is staying put, and Bob Barker isn't happy about it. The City Council voted Wednesday to finish a $42 million elephant exhibit and keep its lone pachyderm at the zoo, despite pleas by the "Price is Right" host and other celebrity opponents to scrap the project. The decision came after an emotional hearing attended by several hundred people. Barker, actress-singer Cher and actress Lily Tomlin were among them after Barker pledged $1.5 million earlier this week to move Billy to a sanctuary in Northern California. "They say it's always been done this way, there's always been elephants in zoos," Cher said. "But it doesn't make it right because we've had other things we're ashamed of, like slavery." But zoo employee Karen Foley, backed by scores of high school science students wearing green "Save Pachyderm Forest" T-shirts, begged the council to "keep Billy where he belongs, with the family he already has." Actress Betty White, a longtime zoo volunteer, also had spoken at an earlier hearing in favor of keeping Billy at the zoo. Supporters of the zoo project cheered after the council vote. Barker, a longtime animal rights activist, said he was "terribly disappointed" and hoped Billy fared better than other elephants at the zoo. Officials have said about a dozen have died there since 1968, but the zoo and its supporters contend many of those succumbed to old age and that it has vastly improved its elephant program. The new, six-acre "Pachyderm Forest" will be seven times larger than the current enclosure and will feature nearly four acres of open space with pools, mud holes and a waterfall. It's one of the largest planned elephant enclosures in the country. Barker, Halle Barry and Goldie Hawn have all complained the new exhibit would still be too confining and depressing for the behemoths that walk dozens of miles a day in the wild. A city budget committee recommended last year that construction be stopped as City Hall wrestles with its economic troubles. About $12 million already has been spent on the project, which is 30 percent complete. Several members were concerned that if the city did get rid of Billy, it would likely have to return the $5 million Los Angeles County has contributed toward building the exhibit. "The emotional issue hasn't changed. What has changed is the economics," said Councilman Greig Smith. "It costs us more money to stop than to proceed."